Northern Garrett High School (NGHS) and the Youghiogheny River Watershed Association (YRWA) are the proud recipients of the Maryland Department of Natural Resources’ Aquatic Resources Education (ARE) Grants. 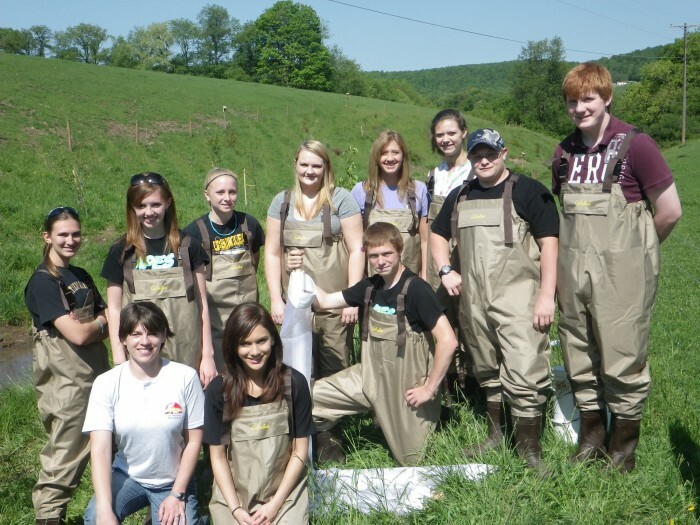 This grant program has enabled Northern Garrett High School’s Environmental Science students the unique opportunity to participate in an action watershed restoration project that provided a hands-on learning and community service experience. This watershed restoration project, named the Cove Run Brook Trout Restoration Project, ultimately benefits the community by improving the water quality and fish populations of Cove Run, a tributary to Bear Creek in Accident, MD. The central goal of the restoration project is to protect and enhance the Brook Trout population of Cove Run. Earlier biological surveys indicated that Cove Run provided a suitable environment for Brook Trout but was on the brink of becoming unfit. The creation of riparian buffers along Cove Run would improve the water quality of the stream and increase its fish population. A riparian buffer is land adjacent to a stream where native grasses, flowers, shrubs and trees are growing. A healthy riparian buffer decreases stream water temperature, which will increase dissolved oxygen levels. Stream bank erosion will be prevented, decreasing the turbidity or cloudiness of the water. The buffer will slow runoff, allowing more water to soak into the ground and recharge groundwater. Nutrients entering the stream through runoff from livestock pastures will also be reduced. The project began this past fall when NGHS Environmental Science teacher Rebecca Kenyon-Sisler teamed up with YRWA to obtain the ARE grants to purchase field equipment for water quality assessments, biological monitoring, and transportation for students to the stream restoration sites. Kenyon-Sisler, Alan Klotz – MD DNR Inland Fisheries Western Regional Manager, and Chuck Hayes of the Natural Resource Conservation Service (NRCS) then began reaching out to landowners whose properties were within the Cove Run watershed. All contacted landowners were very willing to allow a student learning opportunity project on their properties. By the spring, the initial restoration site had been established on the farm of Dennis and Steve Margroff. First, under the direction of Chuck Hayes of the NRCS and Jose J. Taracido - Farmland Habitat Program Supervisor from California University of Pennsylvania, Habitat Forever, LLC installed fencing within a cattle pasture to create a minimum ten foot buffer on both sides of a tributary stream to Cove Run. A cattle crossing was also installed which allowed the cattle to access the stream at one location to drink. Plans are in place to both continue and expand this project. Trees have been planted along Cove Run and one of its tributaries on the properties of Jim Margroff and Bob Bender by the MD DNR Inland Fisheries Service. Habitat Forever will soon begin fencing the stream within a cattle pasture on Bob Bender’s property. This project will allow numerous current and future NHS students to learn about and understand how to protect the natural resources found in Garrett County. The Cove Run Brook Trout Restoration Project would not have been possible without the help and contributions of the following organizations: Maryland Department of Natural Resources, Natural Resources Conservation Service, Garrett Soil Conservation District, Youghiogheny River Watershed Association, California University of Pennsylvania Habitat Forever, LLC – A Pheasants Forever Company, STITCHEN of Accident, MD, Youghiogheny Chapter of Trout Unlimited, Department of Juvenile Services Meadow Mountain Youth Camp, National Turkey Federation, and the U.S. Fish and Wildlife Service. Special gratitude is extended to Dennis Margroff and family, Steve Margroff and family, Jim Margroff and family, and Bob Bender and family for making this student learning project possible. Participants in the restoration project. Kneeling left to right are Rebecca Kenyon-Sisler (teacher) and NHS students Ashley Parandhamaia and Cameron Friend. Standing left to right are students Christine Carpenter, Jessica Klotz, Kirsten Rayner, Sarah Myers, Cari Zbel, Elizabeth Green, Derek Silbaugh and John Major. Edited versions of article appeared in The Republican and the Cumberland Times-News in April, 2012.